Feel like you're losing your mind talking to that gorgeous babe in that slinky red dress? If you find yourself forgetting things like your name when introducing yourself and then later regretting that failed attempt to hold up a smart conversation, we can assure you that it's normal. A research shows that men who spend even a few minutes in the company of an attractive woman perform less well in tests designed to measure brain function than those who chat to someone they do not find attractive. The reason? Men apparently use up so much of their brain function trying to impress beautiful women, they have little left for other tasks (Like remembering our name). 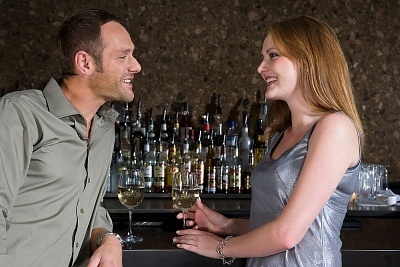 Women, however were not affected by chatting to a handsome man. The study was carried out by the psychologists at Radboud University in the Netherlands after one of them was so struck on impressing an attractive woman that he momentarily forgot his address when she asked him where he lived (Argh what crucial information! His lost.). 40 male heterosexual students were recruited and performed a standard memory test before and after spending seven minutes chatting to male or female members of the research team. The result is that men became slower and less accurate after trying to impress women. In fact, the more they fancied them, the worse their score. Psychologist Dr. George Fieldman, a member of the British Psychological Society said: "When a man meets a pretty woman, he is what we call "reproductively focused." "But a woman also looks for signs of other attributes, such as wealth, youth and kindness. Just the look of the man would be unlikely to have the same effect." Looks like we won't be able to argue against what they say about all men thinking with their junk.